One day I was standing in my kitchen staring at my boring cabinets when the idea came to me! My daughter loves playing with chalk and drawing. The hubby and I often have the need to communicate through various “notes” left around the house. We could really use a better way to communicate. 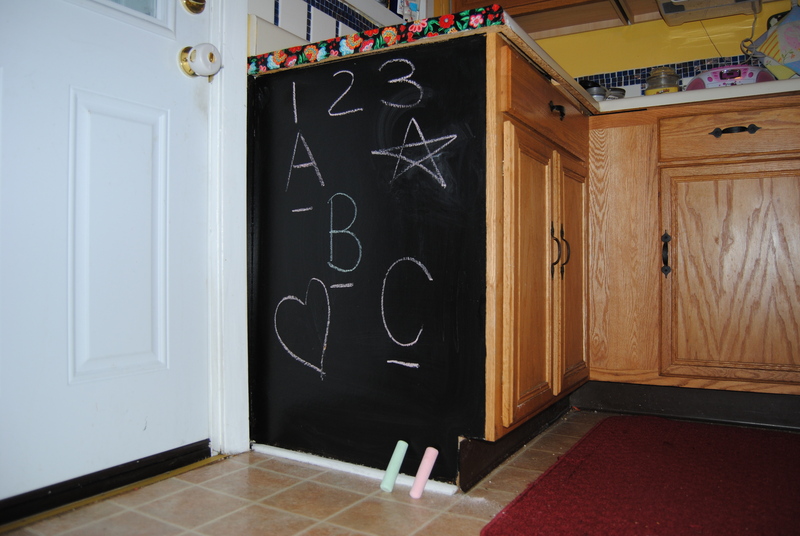 What better way then to create a family chalkboard? 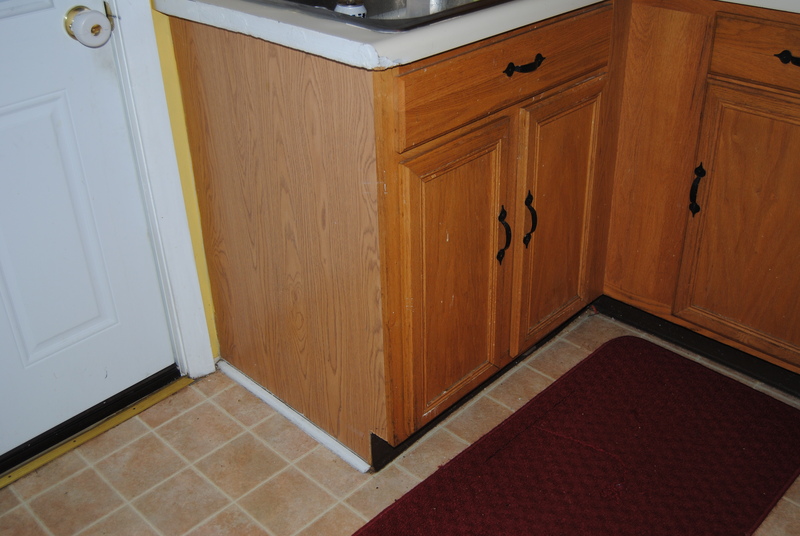 I had often thought about modifying our kitchen cabinets in some way and this was a fun first step. 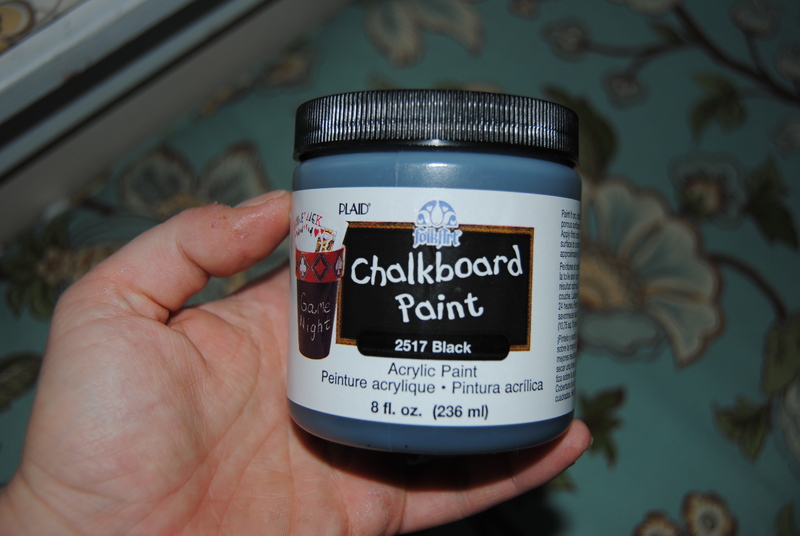 I was eager to try one of the most talked about craft items on the web, chalkboard paint. 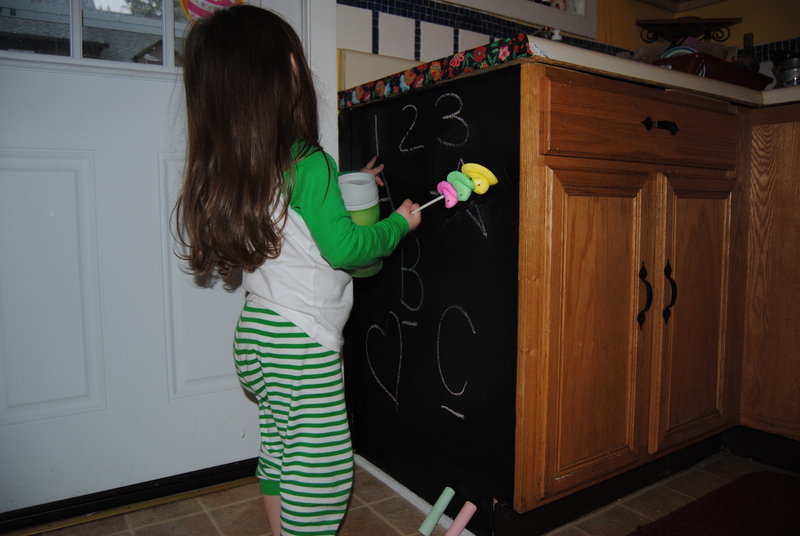 My idea was to use the paint to create a chalkboard on the side of the kitchen sink cabinet, but the ideas for its use don’t end there. Be sure and check out Brit and Co 40 Creative uses for Chalkboard paint and you will be amazed at all the fun possibilities. 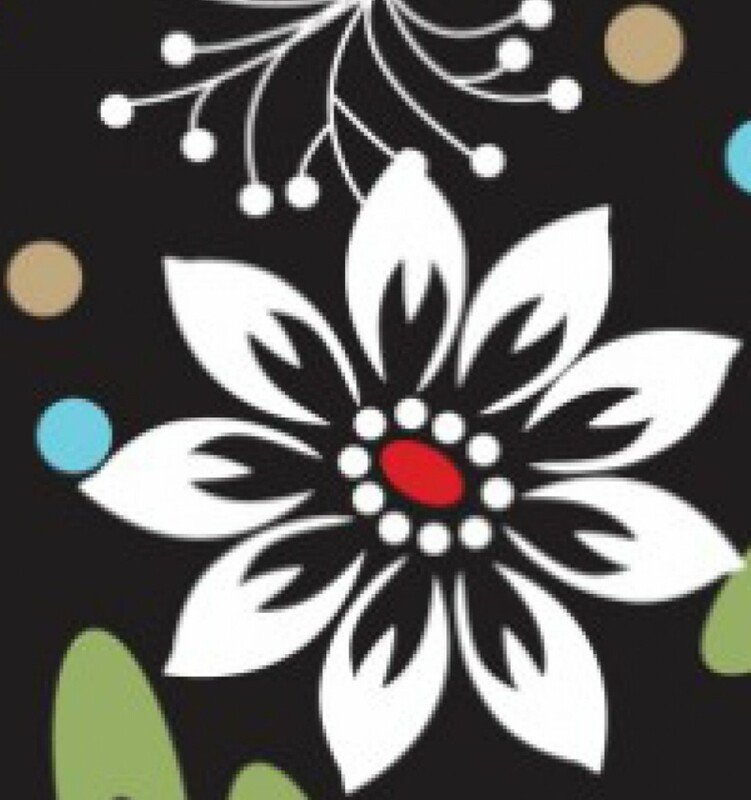 I went to Joann Fabric and picked up some black chalkboard paint. It was regular priced at around 6 dollars, but I used a 50% off one regular priced item coupon which knocked the price down to below 3 dollars! When I got home I cleaned and prepped the area of cabinet I planned to paint. The bottle recommends 2 coats, but I used 4 total as I was attempting to paint over laminate. The project was relatively easy. I used a brush to apply the paint allowing it to dry thoroughly between coats. 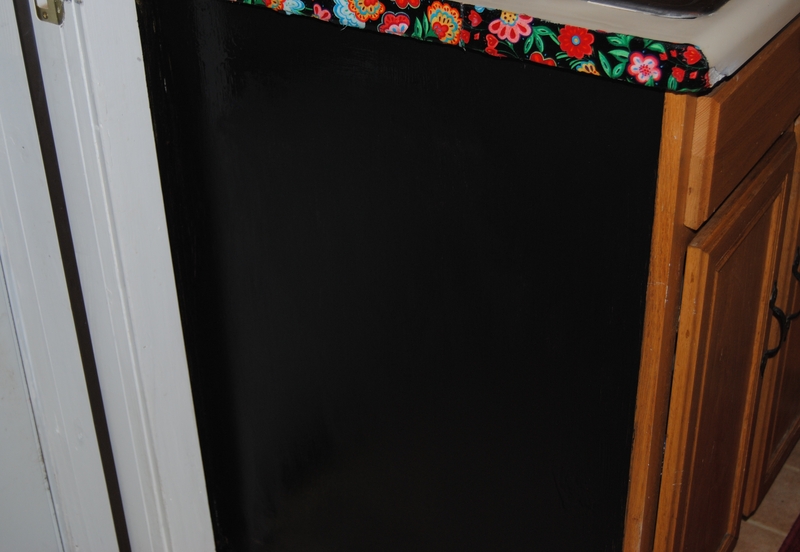 The top side of the sink was damaged so I used a strip of fabric across the top to cover the area and add a little “pop” to the chalkboard. I applied the fabric strip using Mod Podge and covered it in Polyurethane since it could be exposed to water being in such close proximity with the faucet. I waited about 24 hours for the final coat to dry before using the chalk. It worked beautifully! Now we can leave each other messages, post holiday greetings, and our daughter can use her imagination and draw! And yes if you are wondering those are Peeps on a stick my daughter is holding. Happy Easter Everyone! What a great idea! Simple and so functional, and I love that it’s primarily for your child and just her height – Way to go Mom! Well done. It looks good. That’s a good height for kids.